"The FDA approval of larotrectinib marks an important milestone in how we treat cancers that have an NTRK gene fusion – a rare driver of cancer. I have seen firsthand how treatment with larotrectinib, which is designed specifically for this oncogenic driver, can deliver clinically meaningful responses in patients with TRK fusion cancer, regardless of patient age or tumor type," said David Hyman, M.D., chief of the Early Drug Development Service at Memorial Sloan Kettering Cancer Center and a global principal investigator for a larotrectinib clinical trial. "We now have the first therapy approved for this genomic alteration, regardless of cancer type." "Today's approval of Vitrakvi is the culmination of years of hard work and research by many people to bring the first ever treatment to patients with TRK fusion cancer. TRK fusions are rare, but occur across many different tumor types. In this era of precision medicine, we are delivering on Bayer's commitment to advance the future of cancer care while providing value for patients and physicians," said Robert LaCaze, member of the executive committee of Bayer's Pharmaceuticals Division and head of the Oncology Strategic Business Unit at Bayer. "It is very rewarding to provide a therapy specifically for patients with advanced solid tumors harboring an NTRK gene fusion." "We are grateful to the investigators, research teams and patients who contributed to and participated in the larotrectinib clinical trials that supported this approval," said Josh Bilenker, M.D., chief executive officer of Loxo Oncology. "The approval of Vitrakvi is a testament to the relentless prioritization of biology in the drug development process. It is now even more critical to screen patients of all ages with advanced solid tumors for actionable genomic insights that could benefit their care or aid in their referral to clinical trials." The FDA reviewed Vitrakvi under Priority Review, which is reserved for medicines that could provide significant improvements in the safety or effectiveness of the treatment for serious conditions. The FDA previously granted Vitrakvi Breakthrough Therapy Designation, Rare Pediatric Disease Designation and Orphan Drug Designation. "We welcome the FDA approval of Vitrakvi and the innovations in genomic testing that make such precision medicine a reality," said Andrea Stern Ferris, president and chief executive officer of the LUNGevity Foundation. "We're seeing scientific advancements, like genomic testing capable of detecting an NTRK gene fusion, beginning to transform the treatment of cancer and provide new options for patients." 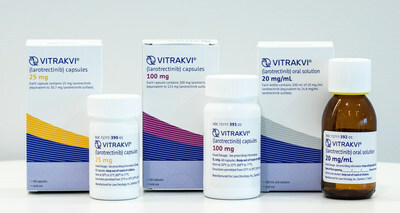 Vitrakvi will be available in oral capsules as well as a liquid formulation for adults and children.2 For more information, visit www.vitrakvi.com. The TRAK AssistTM patient support program provides comprehensive reimbursement support and patient assistance services. For more information and eligibility requirements, please call 1-844-634-TRAK (8725). The Bayer US Patient Assistance Foundation, a charitable organization that helps eligible patients get their Bayer prescription medicine at no cost, is an additional resource for patients in need of financial assistance. "Express Scripts applauds Bayer for its thoughtful approach to patient access. The Vitrakvi Commitment Program represents a significant advance to patient access," said Steve Miller, M.D., chief medical officer, Express Scripts. "We look forward to working together to help those who will benefit from this medicine have affordable access to it." The FDA approval of Vitrakvi® (larotrectinib) is based on pooled data across the Phase I adult trial, Phase II NAVIGATE trial and Phase I/II pediatric SCOUT trial (N=55).2 In pooled study results, Vitrakvi demonstrated an overall response rate (ORR) of 75 percent (95% CI, 61%, 85%) by blinded independent review committee (with 22 percent of patients achieving a complete response and 53 percent of patients achieving a partial response) across various tumor types, including soft tissue sarcoma, salivary gland, infantile fibrosarcoma, thyroid, lung, melanoma, colon, GIST, cholangiocarcinoma, appendix, breast and pancreas.2 Seventy-three percent of responding patients (N=41) had a duration of response (DOR) lasting six months or greater at the time of data cut-off.2 Median DOR (range 1.6+, 33.2+) and progression-free survival (PFS) had not been reached at the time of analysis.2,3 Median time to response was 1.84 months.3 In the safety database (N=176), which included patients with and without an NTRK gene fusion, the majority of adverse events (AEs) reported in greater than or equal to 10 percent of patients were grade 1 or 2.2 AEs of any grade observed in more than 20 percent of patients, regardless of attribution, included increased ALT (45%), increased AST (45%), anemia (42%), fatigue (37%), nausea (29%), dizziness (28%), cough (26%), vomiting (26%), constipation (23%), and diarrhea (22%).2 In October 2018, updated efficacy and safety data on larotrectinib were presented at the ESMO 2018 Congress (European Society for Medical Oncology). Vitrakvi will be available in the U.S. market immediately. Bayer submitted a Marketing Authorization Application (MAA) in the European Union in August 2018. In November 2017, Bayer and Loxo Oncology entered into an exclusive global collaboration for the development and commercialization of the TRK inhibitors larotrectinib and LOXO-195. Bayer and Loxo Oncology are jointly developing the two products with Loxo Oncology leading the ongoing clinical studies as well as the filing in the U.S., and Bayer leading ex-U.S. regulatory activities and worldwide commercial activities. In the U.S., Bayer and Loxo Oncology will co-promote the products. Larotrectinib has not been approved by the European Medicines Agency. Bayer is committed to delivering science for a better life by advancing a portfolio of innovative treatments. The oncology franchise at Bayer now includes five oncology products and several other compounds in various stages of clinical development. Together, these products reflect the company's approach to research, which prioritizes targets and pathways with the potential to impact the way that cancer is treated. Loxo Oncology is a biopharmaceutical company focused on the development and commercialization of highly selective medicines for patients with genomically defined cancers. Our pipeline focuses on cancers that are uniquely dependent on single gene abnormalities, such that a single drug has the potential to treat the cancer with dramatic effect. We believe that the most selective, purpose-built medicines have the highest probability of maximally inhibiting the intended target, with the intention of delivering best-in-class disease control and safety. Our management team seeks out experienced industry partners, world-class scientific advisors and innovative clinical-regulatory approaches to deliver new cancer therapies to patients as quickly and efficiently as possible. For more information, please visit the company's website at www.loxooncology.com. © 2018 Bayer and Loxo Oncology, Inc. All rights reserved. Bayer, the Bayer Cross and Vitrakvi are registered trademarks of Bayer and Vitrakvi Commitment Program and TRAK Assist are trademarks of Bayer. This press release contains "forward-looking" statements within the meaning of the safe harbor provisions of the U.S. Private Securities Litigation Reform Act of 1995. Forward-looking statements can be identified by words such as: "anticipate," "intend," "plan," "goal," "seek," "believe," "project," "estimate," "expect," "strategy," "future," "likely," "may," "should," "will" and similar references to future periods. These statements are subject to various known and unknown risks, uncertainties and other factors that could cause actual results to differ materially from what we expect. Examples of forward-looking statements include, among others, statements we make regarding the timing and success of Loxo Oncology's clinical trials or the collaboration between Bayer and Loxo Oncology, the potential therapeutic benefits and economic value of larotrectinib or other product candidates, and timing of future filings. Further information on potential risk factors that could affect our business and its financial results are detailed in Bayer's public reports which are available on the Bayer website at www.bayer.com, and Loxo Oncology's most recent Quarterly Report on Form 10-Q, and other reports as filed from time to time with the Securities and Exchange Commission. Neither the Bayer Group or Loxo Oncology undertakes any obligation to publicly update any forward-looking statement, whether written or oral, that may be made from time to time, whether as a result of new information, future developments or otherwise. Vaishnavi A, Le AT, Doebele RC. TRKing down an old oncogene in a new era of targeted therapy. Cancer Discov. 2015;5(1):25-34. Vitrakvi® (larotrectinib) capsules and solution for oral use [Prescribing Information]. Stamford, CT: Loxo Oncology Inc.; November 2018. Data on file, Stamford, CT: Loxo Oncology, Inc.; 2018.